This rhubarb and almond crumble tart is a winner and combines all the favourites – crumble, rhubarb, pastry and cream. The crumble topping is flavoured with ground ginger, but you could substitute cinnamon if you prefer. Preheat oven to 200°C. Line a 26 cm loose-bottomed flan tin with pastry and bake blind for 20 minutes. Remove foil and weights and return to oven for 5 minutes. Cream butter and castor sugar in a food processor. Add eggs and yolks, then mix in ground almonds. Tip into warm pastry case and scatter with rhubarb. Bake for 15 minutes, then remove tart from oven and reset temperature to 180°C. 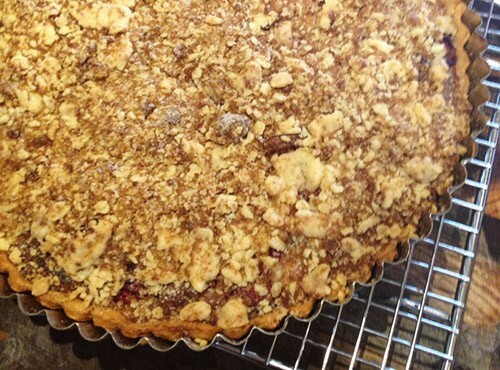 Scatter crumble topping over tart, then bake for a further 35 minutes. Cool and sprinkle with icing sugar, if you wish, and serve warm or cold, with the best cream.